The LA motor show has been inundated with manufacturers showcasing their latest concept cars, giving a glimpse of what future models will look like, and displaying the madcap creations that car designers are capable of when free from the constraints imposed on road-going vehicles. 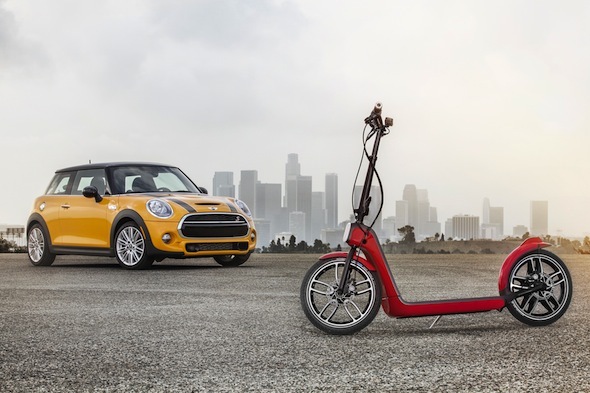 Rather embarrassingly for Mini, the manufacturer forgot to bring any new cars to LA, but has filled the gap with this, the Citysurfer concept. Yes, if you're thinking it looks suspiciously like any old electric scooter, you'd be, well, correct. However, the Citysurfer's USP is that it can fold down to fit into the – let's be frank, tiny – rear load space of a Mini hatchback, where it can be charged via the on-board 12V cigarette-lighter socket. Being a product from a premium brand, the Citysurfer is rather better specified than your average scooter. There's a real disc brake in each wheel, for maximum stopping power, and the scooter rides on properly engineered pneumatic tyres. Vital components are also protected within the vehicle's trim and there's even height adjustable steering and a smartphone holder. With a maximum speed of 15mph and a range of 10-15miles, the Citysurfer is ideal for city-centre dwellers needing speedy transport to get them places even a Mini can't get them. Or it would be, if it were to go on sale. For now, the Citysurfer remains a design study, a glimpse of what could be made if Mini could be bothered to put it into production.